ATF Raids Underground “Straw” Party in Santa Barbara, California! We are coming for your straws! The Bureau of Alcohol, Tobacco and Firearms today broke up a straw party in the city of Santa Barbara, arresting 37 people and charging them with possession of plastic with intent to harm mother Gaia. Santa Barbara, which has proudly become the first city in the United States to ban plastic straws, had asked for Federal help with their straw problem. “We had to act” said Santa Barbara’s mayor, Cathy Murillo. Residents were complaining about plastic straw activity in their neighborhoods. We see it in the schools. Children gathering in bathrooms exchanging their milk money for straws. Back alleys have been overrun with straw addicts wallowing in their filth. Actually that’s the filth from the feces and needles in the streets but my point remains: Plastic straws are gateway straws. From there one moves on to 100-watt light bulbs or high-flush toilets. The line must be drawn with plastic straws. This is the final straw! 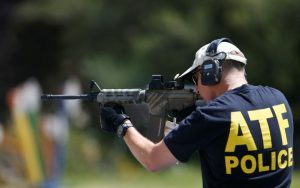 Lacking the resources to fully cope with their plastic straw epidemic the ATF was asked to come in and wipe out the problem. “We at the ATF were happy to help” said its deputy director, Thomas E. Brandon. Alcohol, tobacco, firearms, explosives and plastic straws. All these represent a clear and present danger to Americans. They are killers. And it is our job to kill Americans before they can kill each other. That’s what we do. For over a century whenever Americans needed to be shot or burned to death we have been there. Having received a confidential tip that a “straw party” was going to be held at a school fundraiser ATF agents fanned out across the town to block off possible escape routes of the “strawers.” They also surrounded the school. “These ‘strawers’ make me sick. Yet it is our duty to remain professional” said the ATF officer in charge at the scene of the party. That is why we gave them every chance to surrender peacefully. And by every chance I mean we only threw the minimum amount of concussion grenades into the auditorium before we started firing. As the concussion grenades exploded, women and children, some on fire, came running out of the auditorium. “We’re only trying to raise money for a class trip” said one strawer before she was shot. Naturally we were not sympathetic. What sort of scum uses plastic straws at a school fundraiser? What were these straws used for? To place in sugary soft drinks? If so this would only compound the moral degeneracy of plastic straw users. Fortunately our tactics wiped out all the plastic straws in the school. Probably as a result of the inferno but it’s the end result that counts. Despite the casualties Mayor Murillo has vowed to continue Santa Barbara’s “Zero tolerance” policy towards plastic straws and those who use them.